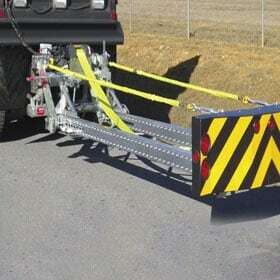 The MPS 350 X is an all galvanized steel, cantilevered truck mounted attenuator for use on stationary and moving shadow support vehicles. This compact TMA has passed all mandatory and optional testing and is NCHRP 350, TL-3 compliant. It helps absorb rear-end design impacts at speeds up to 62 mph. The MPS 350 X is made of galvanized steel components with an open design, which allows of inspection and maintenance with all parts within view and reach. The compact design allows for easy transport and staging. The Durashell® strike plate cover is made of heavy-duty plastic to protect against nuisance hits.